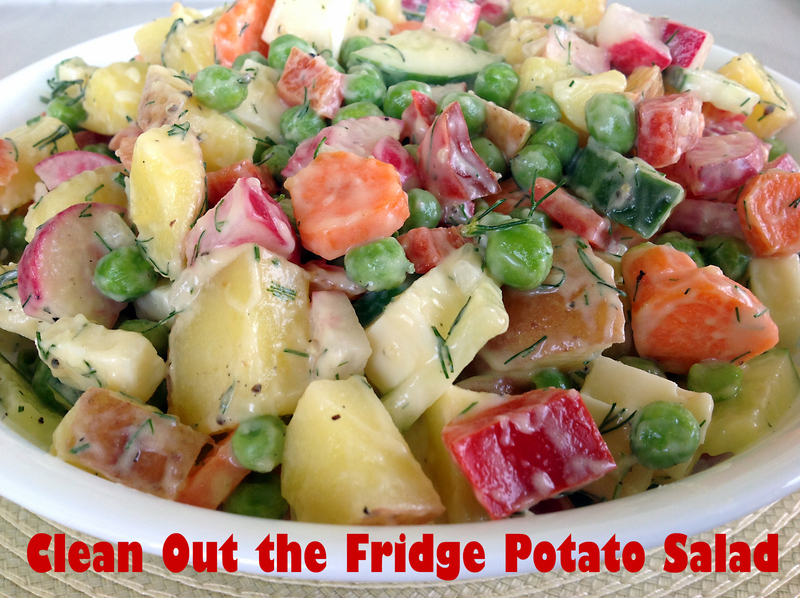 Clean Out the Fridge Potato Salad | Cook It Quick! Have you ever looked in your fridge and found a little bit of this and a little bit of that? And … it should all be used … SOON! Follow these quick “1 … 2 … 3” steps! After my cooked* potatoes had cooled slightly, I cubed them and sprinkled them with a bit of apple cider vinegar — for added flavor — while they were still warm. (Tip: You can leave the skins on young, tender potatoes and Yukon Gold potatoes). While the potatoes were cooking, I cleaned and prepared the following ingredients from my fridge. Use your own preference as to amounts of ingredients. The last step was combining the potatoes and veggies with mayonnaise. Or, use your favorite homemade or purchased potato salad dressing. Then, chill your potato salad for about an hour before serving, to let the flavors meld. Scrub the potatoes, and peel them. Cut the potatoes into 1-inch cubes. Put the potatoes into a saucepan. Cover with water. Bring the potatoes to a boil on medium heat. Let the potatoes simmer for 15 minutes until they’re soft. Drain the hot water, and let the potatoes cool. This entry was posted in Fresh, Local Foods, recipes and tagged alice henneman, healthy cooking, local foods, potato, Potato Salad, recipe. Bookmark the permalink.